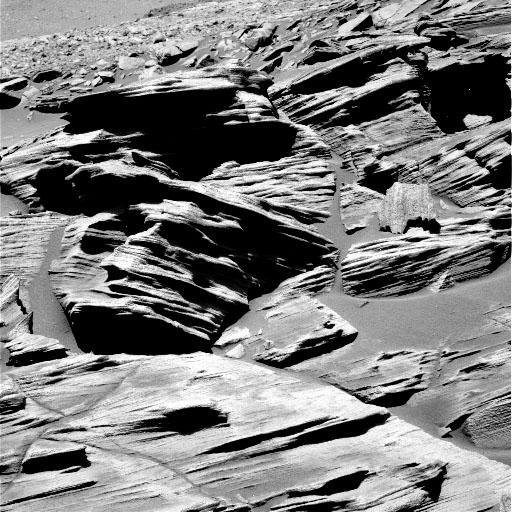 Hectares of fractured quartzite blocks litter the Martian surface. Mars is so often referred to as “The Red Planet” that we forget about the abundance of white rocks and expanses of sidewalk-like pavement. How does electricity relate to the geology of Mars? Mars is largely composed of iron and silicon, with massive quantities of oxygen bound into the soils and bedrock. Although much like Earth geology in some respects, the crust is low in aluminum, one of the most common elements on our planet. Because the atmosphere on Mars is so tenuous – sometimes described as standing on top of a mountain six-times higher than Everest – it lacks the ability to aggressively attack the Martian lithosphere. On Earth, water vapor in the atmosphere forms a weak carbonic acid solution when it mixes with CO2 and that helps to wear away the rocks. On Mars, such erosion is impossible for several obvious reasons, not the least of which is that there is no open water on Mars or in its atmosphere. 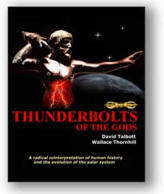 The presence of iron oxide in several different forms indicates that something not taking place on any large scale today did take place at some time in the past. When that past imposed its influence on Mars depends on which of many suppositions are evoked. Some often speculate that there was once a dense, oxygen-rich atmosphere that allowed for “rusting” of the iron in its crust to take place. Others have said that there were oceans of open water on the surface that helped to form the hematite nodules in their trillions that cover nearly a whole hemisphere (perhaps more). Whatever the source, Mars has hematite dunes a kilometer high, giant cracks that go on for hundreds of kilometers with their bottoms covered in hematite ripples, seas of hematite dust tens of meters deep swallowing craters a hundred kilometers in diameter – many of them associated with slabs of silicon dioxide. Once more, the question of oxidation arises in respect to the silicon on Mars. Silicon dioxide is commonly known as sandstone or quartzite. 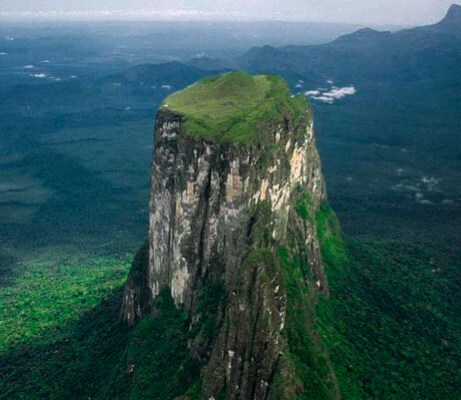 Our Picture of the Day article about the famous tepuis in the three-corners region of Amazonia revealed a structure known as Cerro Autana, a towering monolith rising from the jungle. It is honeycombed with caves and tunnels that penetrate deeply into the rock face. 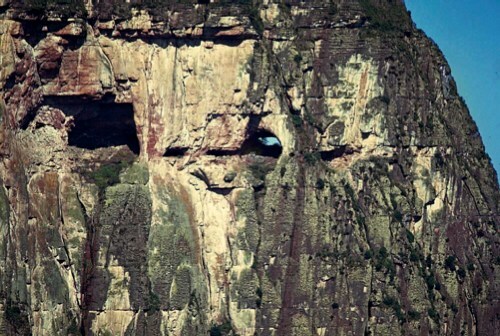 Inside Cerro Autana is a cave 430 meters long and 44 meters high made entirely of quartz – in other words, an enormous geode. In previous Thunderbolts Picture of the Day articles about Mars and the association of hematite nodules, otherwise known as “blueberries”, with large spans of cracked, cobblestone-like rubble, we concluded that there might have been some kind of elemental transmutation on the Martian surface. Electrical energy, flowing underground through selectively conductive materials, can produce many effects, among them the change of one element into another. In the picture at the top of the page is a sample of what other effects might be observed. The striated and layered quartzite is sharp-edged and broken into angular polygons. The fissures running through the chaotic pile are filled with hematite dust. Close up images of the layered chunks show thousands of raised nubbins all over the exterior. When electric currents of gigajoule magnitude explode through the rock strata they blast the material out, forming great trenches. The debris falls back, creating big piles of distorted and half-melted minerals with no sign of how they could have been eroded into their present appearance. Because the transmutation of elements through the z-pinch effect in the flow of electric current is not given any consideration in conventional theories, there are few avenues of experimentation left open. Precipitation and chemical recombination appear to be the main arguments put forward by Mars research scientists, so their theories about its evolution are often inconsistent. Relying upon hypotheses that ignore electromagnetic forces will always produce erroneous conclusions.